I went to a concert on Sunday. And when I got home, I found the window seat had been turned into a village, complete with bookshop, armadillo retirement home, waterfall, art installation and cowshed. So now where am I going to work?? The UNHCR says that more asylum seekers crossed from North Africa to Italy in a single weekend than came to Australia in six months. We had under 5,000 people claim asylum here in the first half of this year. The UNHCR's regional representative has called for a sense of proportion and balance in Australia's public debate on this issue. Sent the girls off to school with their projects for Science Fair tonight. Evie made a diorama labelled 'Dinosours Are Cool!!' Alice has set up a mannequin head with a wig to test whether loose hair or plaited hair gets more knotty. 'Test it yourself with this comb.' Had to convince her that the school would take a dim view of any projects that involved explosions or setting fires in the school building. She watches way too much Mythbusters. Ran into X in the supermarket. Had to run home afterwards and check I was looking okay. Just goes to show that you have to watch what you wear JUST IN CASE. Three years since J died. Feeling so sane and together & good about myself & calm - hard to believe I have such attacks of misery and despair. But they pass, they pass... Confident that there's a boy out there with my name on him. I imagine myself in an institutional bed, dying, delirious, mad, clutching D's hand and B's while they gaze into each other's eyes over my prostrate body, completely oblivious to me. Why am I so pathetic? Why don't I bash their heads together? Not only did I have my FOURTH cold shower this morning, I had to do BREAKFAST DUTY - I have rarely been so pissed off. Went home and out for dinner with family - had a Brandy Alexander. Eggy just brought someone in to look at my room, "a pretty typical first year room, I s'pose," he says. Funny thinking of the poor girl & being like that last year & now look at us. Priorities: Maths exercises. Latin translation. Science questions. History for Specialists genealogy project. Speech notes. Geography assignment. I feel sick. We have to dress up in the traditional clothes of a United Nations Country. I don't know which to be. I changed my library books. Weather: Cool. Made Christmas cards. 6 more to do. Rain. She is very busy in her room. She comes out to raid the kitchen, for biscuits, for a teabag. 'Can I have those oranges, Mummy? This bag of coffee beans?' She washes her fancy teaset, which has been gathering dust on the shelf. 'Have we got a bigger tray than this?' I give her the big square chopping board. 'Never mind!' The door shuts firmly behind her. 'I don't want bad luck either!' But I put it up anyway, because that's what mothers do. She looks mysterious. 'To be part of a time machine.' The door closes again. Presently she comes out and gives me a big, silent hug. 'Goodbye, goodbye!' cries her sister, agog. 'You said you were making a time machine!' Her sister dances about. 'Then we're in trouble,' I say. I usher her sister away. And I feel sorry; I think I understand. If only we hadn't put it into words, if we could only have let that mysterious silence be -- that silence where fragile belief can unfurl -- it would have been all right. But our words wrecked everything, made her face the fact that it wasn't true, that her time machine was only an umbrella, some oranges and a mobile phone; that the Doctor wasn't going to land in her bedroom for afternoon tea. Later that evening she cries her heart out, because the Brigadier died before the Doctor could see him again, because he'd put out the extra glass of brandy every night in vain. She cries for the Brigadier's disappointment; she cries for the Brigadier's hope. 'It's too sad,' she sobs. You also can't visit a person who is imaginary; but, being my daughter's mother, it doesn't even cross my mind to say it. Tears shine on her cheeks, and I say nothing at all. If anyone had told me twenty years ago that I, writer and book addict, would marry a man who is not a reader, I would have laughed in their face. And yet so it has come to pass. Well, a strange and wonderful thing has happened. Like everyone else in Melbourne, we watched the first episode of The Slap on the ABC this week. And lo, my husband enjoyed it so much that he took down the book from the shelf and began to read it. He's now up to Chapter 3, with no signs of flagging. He says it's "really, really good." Last night he kept the light on so he could read, long after I'd shut my eyes - a complete role reversal. Will The Slap turn my husband into a Reader of Novels? We shall see. 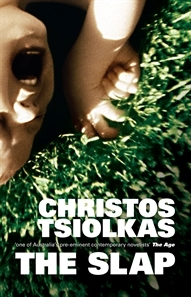 But thanks, Christos!